How I Found It: I've read all of the Robert Langdon series. Summary: Robert Langdon once again finds himself entangled in a dangerous race against the clock. This time, he's out to avenge a friend and reveal research about the origin and destiny of humanity. First, Dan Brown is not a great writer. He has an awesome ability to research, a great ability to weave together a thrilling story, and a decent imagination. All of those are fabulous qualities, but they don't always correlate to a high-level skill with the English language. I, and likely most of his audience, come to him for something other than Faulkner-esque prose. Still, I'd love to see his story-telling ability combined with the linguistic and character mastery J. K. Rowling brings to the Cormoran Strike series. Basically, the big twist at the end and message of the book is that we are well on our way to become a codependent species with our own technology. Once we hit the Singularity (the point when technology becomes sentient), we will have crossed a threshold and tech will rule the world as humans do now, but more as a kind of co-rule, since we're dependent on one another. This is a cool conclusion, but I found it the least shocking idea ever. Anyone can look around at our increasing dependence on technology and its exponential development and predict something similar. We literally talk about this idea in my community college Critical Thinking class when we do a day on artificial intelligence. It's not a new idea. Now, Brown didn't have to give us a new idea or shake the proverbial foundations of Western thought like he's been touted to do in the past. It's totally fine for him to take this idea and run with it. I just don't like when the book is hyped as being controversial (and when he clearly wrote it with that intention) but delivers something so seemingly predictable as its conclusion. He does also theorize about the origins of the universe, but that seemed too abstract to be controversial to me. He got into the weeds too much while explaining the idea. Brown really plays up the science vs. religion element. To the point where I got a bit annoyed. I get that the two have a rough history of playing nicely together. Hence, I understand writing a book highlighting that friction. However, Brown's ultimate message seems to be that they can get along just fine (see the quote below). Now, I agree 1000% with that message. But why write a whole book accentuating the conflict only to drop some subtle counter-messaging. It felt off balance to me. I did, however, like learning that our beloved Langdon, after all his adventures, remains quite open to the possibility of a greater power. That was a nice surprise after the scientist character spent so much time blasting faith traditions. Now...(spoiler warning here again)...the actual last twenty pages or so where way more interesting that "the big reveal" in my mind. Learning that Winston, the ultra-intelligent AI who has helped Langdon and his ubiquitous female companion throughout the book, actually pulling the strings behind so much of the danger and death in the book was great. I did see it coming, but Brown pulled it off well and I found it to be a satisfying conclusion after a disappointing big twist. I liked the twist of including the (fictional) Spanish royal family here. You all know how obsessed I am with royalty, so that was a very fun element for me. Ultimately, Brown has given us what he always does: a book that keeps us reading, gets us thinking a little, and may even make us laugh at its simplistic prose. It's not a bad, but it's certainly not a great one. Guilty pleasure reading at its peak. It's a bit of a topical divergence for Robert Langdon, but stylistically it meets every marker with which we associate the character. If You Like This, Try: The rest of the books in the Robert Langdon series. 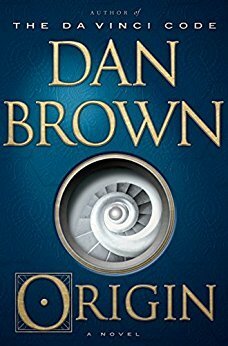 A Reduced Review: I really like Dan Brown's Robert Langdon books...but this was definitely not the best of them.